His new analysis in “Science Advances” reveals three groups responsible for moving most of the smuggled ivory out of Africa. On June 5, 2014, Kenyan police entered a Fuji Motors car yard in the port city of Mombasa, where they found a two-ton stash of ivory. The discovery led them to a middle-aged Kenyan named Feisal Mohamed Ali, who two years later was sentenced to 20 years in jail. Conservationists hailed it as a major blow to the international poaching syndicates responsible for killing 40,000 endangered elephants in Africa every year. With only 400,000 animals left on the continent, these crime networks threaten to wipe out every last African elephant within the next two decades. Half a world away in Seattle, Sam Wasser read news of the verdict with growing elation. A conservation biologist at the University of Washington, Wasser had been analyzing the DNA of seized elephant tusks, comparing it with the DNA of other elephants he had studied, and sharing his findings with Kenyan authorities. His work had concluded that multiple ivory hauls had originated from a single cartel believed to be headed by Feisal. Even though Feisal was only tried for one count of possession, the length of the sentence sent a message. “At the time, it was the biggest positive thing that had happened in this whole long fight,” says Wasser. Then in August of this year, a Kenyan judge abruptly reversed Feisal’s conviction, ruling it unconstitutional because of irregularities in the case. The conservation world was furious. But Wasser saw an opportunity. Now, Feisal and his five co-conspirators will be re-tried, and this time, prosecutors will have access to even more detailed genetic evidence connecting multiple shipments to just a few powerful criminal networks. In a report out Wednesday in the latest issue of Science Advances, Wasser’s team reveals their latest analysis, which shows three cartels are responsible for moving the majority of smuggled ivory out of the continent through the port cities of Entebbe, Uganda; Lome, Togo; and Mombasa. The analysis builds on work Wasser began decades ago. He has spent much of his career collecting elephant poop from every corner of Africa, amounting to a genetic map of most of the animals on the continent. Using his DNA database, Wasser can pinpoint the origin of a recovered piece of ivory to within 186 miles, an area about the size of Colorado. In 2005, he got an email from a friend in Interpol’s Wildlife Crimes Group named Bill Clark. Authorities in Singapore had seized six and a half tons of ivory, and Clark thought it was time to test out Wasser’s map. Law enforcement authorities assumed such a large shipment must have been amassed from sellers all over Africa, but Wasser’s DNA analysis painted a different picture. All the ivory had come from one population of elephants in southern Zambia. “Bam, that just changed everything,” says Wasser. He figured if he could use his methods to connect contraband to its point of origination, law enforcement could lock down the trafficking at its source. Since then, Wasser has been criss-crossing the globe analyzing the DNA of seized ivory shipments to help law enforcement officials understand where a seized stash of ivory originated and how far it’s traveled. This expensive work has been financed in part by Microsoft cofounder Paul Allen’s family foundation, as well as by grants from the US State Department, the UN Office on Drugs and Crime, and Interpol. By 2015, Wasser had analyzed 28 large shipments and identified a recurrent pattern. Over and over, tusks that showed up behind false walls or buried in fish entrails in containers as far away as Hong Kong and Malaysia could be traced back to just two regions in Africa. One was the Tridom forest, which sprawls over areas of Cameroon, The Republic of Congo, and Gabon; the other was primarily in Tanzania. He published his findings in Science in 2015. Wasser had hoped that uncovering the world’s two major poaching hotspots would shift the ivory wars in the elephants’ favor. But it didn’t work out that way. “To our surprise, the trafficking remained very hard to stop,” says Wasser. Poachers operate in large areas they know well, and they’re often better armed than wildlife rangers. Like other forms of organized crime, poachers tend to function solely as foot soldiers; arrest 10 in the field and 10 more pop up to fill their place. To make real headway, authorities have to focus on the players further up the supply chain. Not long after the publication of their paper in Science, Wasser’s team had a breakthrough. In October, Wasser was summoned to Singapore to sample a new seizure—4.6 tons of ivory hidden in sacks labeled as long-grain rice or sugar. He brought with him a colleague, Sam Tucker, a forensic scientist. Together, they began the process as usual. First, they weighed all the tusks and measured the diameter of each one at its base. Then they laid them out on the floor, smallest to largest, and began arranging them further according to the length of the gum line—the distance from the tip of the tusk to where it tucks into the animal’s lip. After four days of this, Wasser usually has a pretty good idea of which tusks are part of a pair, which helps him set one aside so he’s not sampling from the same animal twice. At $110 per DNA sample, it’s as much about cost as it is about not inflating the genetic database with duplicates. But on this trip, he found hardly any pairs. The mystery kept gnawing at Wasser and Tucker even after they returned to Seattle. Then one afternoon, Tucker burst into Wasser’s office. “Sam, did you look in the other seizures for those missing tusks?” he asked. He hadn’t. Within days, a coder in Wasser’s lab had a new matching algorithm up and running to compare every tusk with the others in their database. It was an idea Tucker got from his days doing forensic work for the US military in Afghanistan, linking IEDs to specific terrorist cells and individuals. When the analysis finished running, “this whole picture just exploded in front of us,” says Wasser. The pairs had been there all along, they’d just been shuffled into different shipments. DNA not only brought tusks back together, it revealed where all these seemingly unrelated ivory hauls came from. When Wasser’s team combined the genetic profiles with information gleaned from shipping documents, what emerged was a complex network connecting the largest ivory cartels in Africa. That analysis helped Kenyan law enforcement officials bolster their own evidence, including phone calls and shipping paperwork, linking the stolen caches to Feisal. He is hopeful that the intelligence he’s gathering on the Mombasa cartel will strengthen the prosecutors’ case in Feisal’s retrial. And maybe even bring down another ivory kingpin or two. For Wasser, the convictions can’t come soon enough. 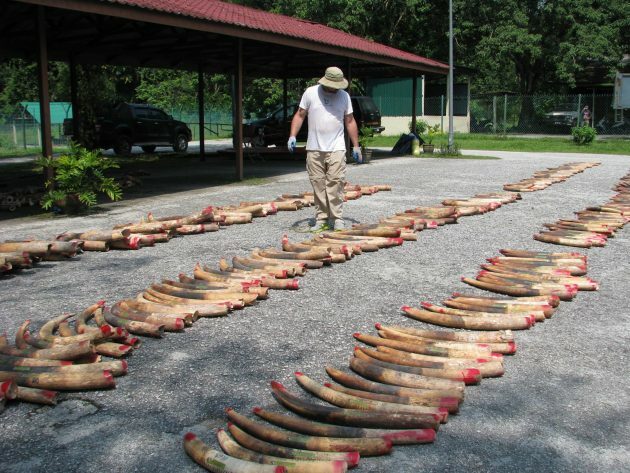 On the last seizure he sampled—1,800 tusks found in Singapore earlier this year—two-thirds of them were shorter than his arm, thick as a quarter at the base. They came from animals not older than five or six. “Every year the tusks keep getting smaller,” says Wasser. Without action, the elephant DNA in his database may turn from a tool to save the species into a grim record of the animal’s extinction.